Can acupressure help relieve constipation and other digestive problems? Constipation is usually the result of poor diet. However, it can also be caused by many other health problems that interfere with proper digestion and bowel movements. Thankfully, acupressure can help. The life energy that flows through our body's meridian system can be balanced and enhanced to promote healing of almost any health problem - including constipation and digestion distress. Although balancing your energy system via acupressure can heal many health problems all by itself, in the case of constipation it's also recommended that you work on improving your diet. Adding more daily fiber intake is usually a good idea. The acupressure points below will help your digestive system work properly and help get rid of constipation. 1. Conception Vessel 6, on the lower abdomen, three finger widths below the belly button. Use this acupressure point to relieve your constipation. It will also help reduce pain in the abdominal muscles. 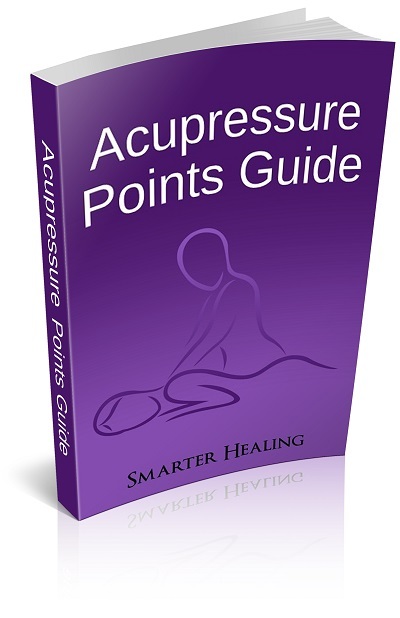 Also with those issues, this pressure point can also help get rid of gas, and help heal colitis (inflammation of the bowels). 2. Stomach 36, on the front of the leg, four finger widths below the knee cap, slightly towards the outside of the leg. Applying pressure to this point will strengthen your entire body's muscular system. It will also help improve digestion, relieve all types of stomach problems, and also help get rid of intestinal disorders. 3. Large Intestine 4, on the back of the hand, between the bones of the thumb and index finger. Warning - Pregnant women should never use this point. This acupressure point can cause early contractions which could be detrimental to your pregnancy. Use this easily accessible acupressure point on your hand to relieve constipation. It will also help a range of other pain-related conditions, including headaches, toothaches, arthritis pain, labor pains, and shoulder pain. 4. Large Intestine 11, found along the outer edge of the elbow crease. 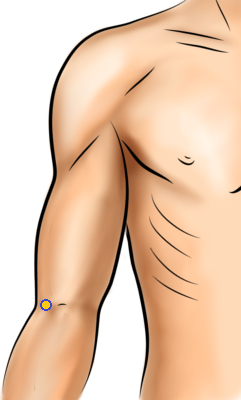 This is a powerful acupressure point for restoring health to the large intestine. It will help relieve your constipation and indigestion issues. This point is also used to reduce a fever.